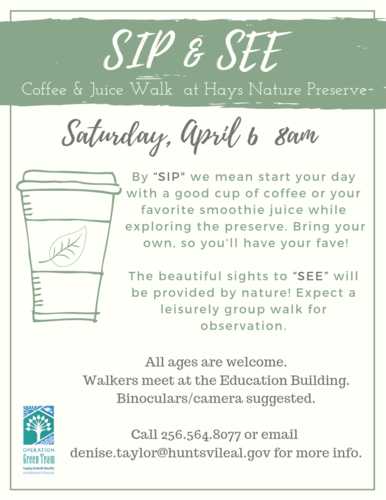 By “SIP" we mean start your day with a good cup of coffee or your favorite smoothie juice while exploring the preserve. Bring your own, so you'll have your fave! The beautiful sights to “SEE” will be provided by nature! Expect a leisurely group walk for observation. All ages are welcome. Walkers meet at the Education Building. Binoculars/camera suggested. Call 256.564.8077 or email denise.taylor@huntsvileal.gov for more info. Owens Cross Roads is located in the Huntsville & Decatur Region of North Alabama. Be sure to check out places to Go, Eat, Stay, and other events in Owens Cross Roads.